As many of you know, I have done a lot of work with the Think Productive team over the years and reviewed (and loved) many of the books that they have released. When I heard that Graham had a new book coming out, I instantly volunteered to review it as I definitely need another productivity boost! The team were keen enough to gift me a copy and I devoured it in about 24 hours! Work Fuel is different than the other books from Think Productive that I have read before however. Graham Allcott has teamed up with Colette Heneghan, a nutrition coach, to transform your meals into a productivity boost. 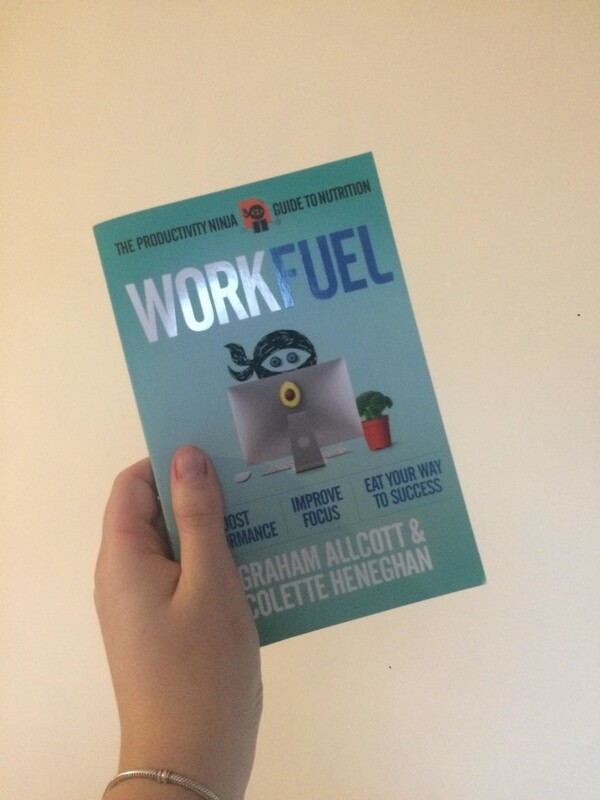 As someone who has definitely found myself relying on the habits of How to be a Productivity Ninja a lot recently, I knew this was the book I needed to give me a little extra support. In recent months, I’ve found myself in a new job that takes up a lot of my time and energy. It has also made me realize that I having been that kind to my body, letting it run of caffeine and adrenaline way too much. I knew I needed to start looking at what I was eating and drinking but if I’m honest, I had no idea where to start. This is where Work Fuel has been transformative for me. The science behind the food we eat was explained simply so that even I could understand it! Rather than bogging things down with nutritional information that was way more than I could comprehend (or even wanted to), it was full of practical tips and recommendations for ensuring that the food you choose to eat helps you concentrate, focus and get through your to-do list. I particularly appreciated the shopping list ideas and little recipes that you can follow with little specialist equipment or ingredients. For someone who isn’t particularly confident in the kitchen and doesn’t have time to spend hours in there, it was the perfect way to address the food I am eating! If you’re looking for something more hands on, there are also exercises throughout the book. I will be dipping in and out of the book as a source of reference now that I have read the whole thing but it is perfectly designed for just that. I can’t wait to start using this as a practical guide to boosting my productivity! P.S I was gifted this book from the publishers but all thoughts are my own.